Peptide microarrays with overlapping linear peptides are the method of choice for antibody epitope mapping. However, many epitopes rely on protein folding and form so-called conformational epitopes. Such conformational epitopes can hardly be detected with standard microarrays based on linear peptides. To overcome this hurdle, PEPperPRINT developed high content microarrays with constrained cyclic peptides libraries that mimic conformational motives. In a present application note, we analyzed the binding behavior of Rituximab (Rituxan™), a therapeutic monoclonal antibody directed against the extracellular domain of the CD20 receptor. Based on crystal structures, Rituximab is known to interact with the 15 amino acid loop NIYNCEPANPSEKNSPSTQYCYSIQ of CD20. To get an in-depth view on the actual conserved core motif of Rituximab, we started a high resolution conformational epitope mapping study based on peptide microarrays with linear and constrained cyclic CD20 peptides. While we did not observe any response of Rituximab against linear CD20 peptides, the constrained cyclic peptides showed clear signals with excellent signal to noise ratios that were attributed to peptides with the consensus motif EPANPSEK. The epitope was further characterized by a full conformational epitope substitution scan with 20 L-amino acids to identify conserved and variable amino acid positions. The detailed knowledge of each individual amino acid of an epitope paves the way for a precise bioinformatic analysis of possible cross-reactions of a monoclonal antibody. Even more important may be the correlation of essential amino acid positions in the epitope of a therapeutic antibody with sequencing data of patients for patient group recruitment in clinical trials, or the differentiation between responders and non-responders before therapy. The identification of e.g. 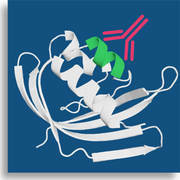 point mutations in a highly conserved epitope stretch can help minimizing the risk of failure in clinical trials and enables a personalized and more efficient treatment of patients with therapeutic antibodies. Last but not least, the detailed epitope data of the PEPperMAP® Substitution Scan helps to distinguish two similar monoclonal antibodies or a standard antibody from its biosimilar for regulatory purposes. Download the detailed report Characterization of Rituximab by Conformational Epitope Mapping and Epitope Substitution Scan including experimental details, raw and microarray data from our Application Note website.